TIP Securities have been around only since 1997, placing them a time period with only relatively tame levels of inflation. That being said, the need for inflation protection is very relevant, and investors now have access to five TIPS ETFs. They give investors a choice among broad based, intermediate, short-term and long-term durations. Gravitating towards shorter duration bond holdings in the TIPS marketplace will mean choosing a higher correlation with inflation, lower volatility and only small yield differences. PIMCO is currently the only ETF issuer with a full family of TIPS exchange-traded products. Duration is a measure of the average life of a bond. The duration of a bond is the percentage change that a 1% change in interest rates will move the bond’s price in the opposite direction. For example, a bond with a 5-year duration will decrease 5% when interest rates increase 1%, all things being equal. Currently, PIMCO 1-5 Yr US TIPS Index Fund (NYSEArca: STPZ) is the only TIPS ETF giving investors access to the short end of the yield curve in the TIPS marketplace. The ETF in this space with the 2nd lowest duration is the iShares Barclays TIPS Bond (NYSEArca: TIP). 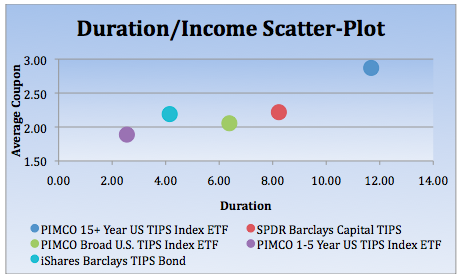 The iShares Barclays TIPS Bond (NYSEArca: TIP) has an effective duration of 4.15, while PIMCO 1-5 Yr US TIPS Index Fund (NYSEArca: STPZ) has an effective duration of 2.55. TIPS ETF funds are great to compare since the US government equally backs up the income and principle from the bonds held by these funds. Of the two lowest duration funds, SPTZ and TIP, the yield difference is important when looked at in relation to duration and risk. Here’s a breakdown of the ETFs on the market today that compares average coupons and duration. The chart below is similar to a risk/reward scatter-plot, replacing risk with duration and return with the average coupon payment. Data is from Morningstar, Inc. There is a very clear pattern formed in that duration is rewarded with risk, but not in an efficient way. This is not a yield curve, since maturity and yield are not being measured, but rather a measure of maturity and a measure of yield (average coupon). TIPS, or Treasury Inflation Protected Securities, have a built in feature that adjusts the principle of the bond based on changes in inflation. When investing in TIP Securities, the lower term the bond is, the higher correlation to inflation the bond will have. This is because shorter-term bonds are effected less by interest rate movements and investors’ interest or inflation sediments. Therefore, a change in inflation is more clearly reflected the shorter-term TIPS bond. According to PIMCO’s research, The BofA Merrill Lynch 1-5 Year US Inflation-Linked Treasury Index (the index PIMCO’s STPZ tracks) has a .27% correlation to inflation, while the Barclays Capital U.S. Treasury Inflation Protected Securities (TIPS) Index (the index for iShares’ TIP) has a .07 correlation to inflation. In the current low inflation and interest rate environment, now is a good time to buy inflation insurance and dial down on duration exposure. TIPS have another unique usage for investors that relates to inflation. Investors often purchase commodities as a way to protect against inflation and use TIPS as collateral for their commodity futures positions. For instance, PIMCO uses TIPS as collateral in its Commodity Real Return mutual fund. Since the yield from TIPS is a real return, meaning inflation is included, investors do not need to worry about losing in a high inflation environment. The main case for TIPS would be during an inflation spike. The Federal Reserve appears to be committed to low inflation and low rates for the time being, aiding the US Government with a low borrowing rate. The question is whether or not this is an artificial environment. Will inflation begin to happen despite the Fed’s best effort because of the country’s growing debt-to-GDP level, currently at 54%? There are some particular market scenarios where TIP Securities do great and some others where TIPS can be a scary investment and lose a substantial amount of value. In a scenario mentioned by Anne Lester, a senior portfolio manager at JPMorgan Funds in a May 2009 WSJ article, interest rates rose from 10% to 15% while inflation (CPI) fell from 14% to 10% from July 1980 to July 1981. She refers to this time (TIP Securities did not exist at the time) as the “perfect storm’’ that could cause TIPS to lose 20% in value. It is important to note that with TIPS indexes, bonds are being rolled in and out as they fit into or become excluded from the indexes target ranges, and many indexes do not just hold bonds until maturity. Also, it should be noted that the par value of bonds is changed based on the change in inflation. Like the situation above, in a high inflation environment where inflation moves down, par values of these Treasury Bonds would decrease. Although PIMCO is firm about active bond strategies being more efficient than indexing, they seem to be dedicated to running an effective indexing strategy with the ETF vehicle offering a full family of indexed TIPS ETFs, ranging from long, broad, and short term. The PIMCO 1-5 Year US TIPS Index Fund (NYSEArca: STPZ) is the most popular of the three with over $500 Million in assets. The underlying index, the BofA Merrill Lynch 1-5 Year US Inflation-Linked Treasury Index, is capitalization weighted and is rebalanced monthly. The PIMCO 1-5 Year US TIPS Index Fund (NYSEArca: STPZ) pays dividends monthly and has a low 20 basis point expense ratio. Holding only 11 bonds, this ETF is set up to efficiently have low turnover. The effective duration of this fund is 2.55 years. With a specialized bond like TIP Securities, keeping maturities low is where the benefit of the inflation hedge is at its best. The other factors that affect bond price can be minimized in lower maturities. The primary reason an investor allocates into TIPS is to hedge against inflation. Low duration TIPS will benefit from increasing inflation (CPI) and the expectation of inflation increasing. Both of these factors will be directly affect these bonds’ prices and lower maturities will allow the highest correlation to these factors that the investor is looking to access.